I stopped eating animals two months ago. The decision was personal. I hadn’t planned on writing about it here, and I realize that the topic of whether or not to eat meat can elicit strong emotions on either side of the argument. I would just ask that if you feel the urge to comment, please wait until you’ve read this entire post. It might surprise you. Two months ago, I read the book Eating Animals, by Jonathan Safran Foer, whose novel Everything is Illuminated is one of my all-time favorites. I didn’t choose to read Eating Animals because of the topic but because I loved its author and because it was a BlogHer book club selection; I honestly didn’t expect to learn anything more about the meat industry I hadn’t already read about in The Omnivore’s Dilemma or Fast Food Nation or seen in the film Food Inc . I knew how bad the conventional meat industry was. I knew that the conditions for chickens, cows, and pigs were abysmal and that raising them, as well as overfishing the oceans, was wreaking havoc on the environment. And yet, I loved cheeseburgers. I mean, I really really loved them. And believe it or not, the cheeseburgers I craved were not even made from organic, humanely raised meat, but came from McDonald’s. I loved McDonald’s double cheeseburgers, to be exact. And I also reserved a special place in my heart for McDonald’s Egg McMuffins with their slabs of Canadian bacon. I mostly resisted these “foods” and felt extreme guilt when I occasionally succumbed to the urge. But the negative consequences of eating that kind of meat were purely intellectual to me. In practice, I had a hard time connecting that burger with the animal it had been. Eating less meat, especially less factory farmed meat, was something I did because I knew I “should.” I knew it was bad, but I didn’t know it. According to Wikipedia, Harris Ranch keeps about 100,000 cattle on 800 acres. That’s .008 acres per cow. Compare that to the 1-2 acres per cow needed for pasture grazing, which is how calves are raised before they are weaned and forced to spend the rest of their lives in these deplorable conditions. Passing the feedlot, I would feel a momentary twinge of sadness and guilt before turning my head to look away. If seeing a sight like the Harris Ranch feedlot didn’t stop me from craving meat, perhaps my knowledge of the environmental damage resulting from the meat industry should have. Livestock production generates about 18% of human-derived greenhouse gas emissions. Animals confined in feedlots produce a larger concentration of waste than the environment can absorb, resulting in pollution runoff into our waterways and groundwater. The grain and forage required to feed livestock has led to the destruction of large portions of the world’s forests for crops and grazing land, forests necessary to sequester carbon dioxide and reduce greenhouse gas emissions. Industrial meat production requires huge amounts of water — for feed crops, for animals, for cooling and cleaning facilities, and for processing the meat itself. For these reasons, the livestock industry accounts for 8% of global water use. Cattle contribute significantly to greenhouse gas emissions directly through exhalations of methane gas (burps and farts) as well as nitrous oxide from their manure. Illnesses such as swine and avian flu are more likely to mutate into more aggressive diseases in intensive feed operations where animals are crowded together and pathogens can gain access to an abundance of susceptible hosts. Those are just a few of the major environmental effects of the industrial meat industry. And the industrial fishing industry contributes to the destruction of entire marine ecosystems. Knowing these facts prevented me from eating flesh foods on a regular basis. I resisted those cheeseburgers the best I could and mostly stuck to chicken here and there. I didn’t keep meat in the house (except for what we fed our cats), and I tried to patronize restaurants that claimed to serve local, humanely-raised meat. But I wasn’t strict about it. I rationalized that I ate so much less meat than the average American that it really didn’t matter. Near the beginning of the book, Foer presents a case for eating dogs. It’s a thought experiment, nothing more. But his arguments are pretty reasonable. There is a huge population of stray and unwanted dogs and cats (3 to 4 million) that are euthanized annually. Right now, the flesh of these dogs and cats is sent to rendering plants where they are converted into food for farmed animals. Why not skip that step and eat them directly? It would create much less environmental impact. It could, in fact, be argued that eating stray dogs and cats is actually a very eco-friendly thing to do. It’s Soot’s job to lie on Michael’s lap and allow himself to be combed until his coat is so shiny and slippery he sometimes slides off furniture onto the floor. (Sooo funny.) Arya, on the other hand, is the punk rock chick, the scruffier the better. No combing for her. Soots hides under the bed when strangers visit. Arya climbs on their laps or sniffs the inside of their shoes. And of course, it’s also Arya’s job to hunt down and eat plastic. How is a dog or cat any different from a cow or a pig? Why shouldn’t cats and dogs be included in our dinner options? In many countries they are routinely eaten. But I wouldn’t eat a dog. And suddenly, in light of this comparison, cows and pigs didn’t seem so much like food to me either. And then the cruel realities started to sink in. I have to clarify that I didn’t actually read Eating Animals. I downloaded the audiobook and listened to it through headphones. So it was like being strapped into a roller coaster seat. You can’t skim past that first big drop and move on to less terrifying parts of the ride. You have to let go and experience every moment of it. So it was listening to the litany of every day horrors associated with farming animals. Many of us have seen the images of downer cows being prodded and dragged to the slaughter house. But did you know that in most states, it is very common and legal to simply leave them to die of exposure over several days or to toss them alive into dumpsters? Last night, in doing some additional research for this post, I stumbled upon a photo that I can’t get out of my mind. A cow whose neck had been broken due to rough handling was left to suffer on the ground until she died. But according to Foer, not all of these downers are animals that would have died anyway. Some of them are simply dehydrated, but the pace of the factory system does not allow for the individual care of such animals. And what about poultry and fish? It was just as hard to hear of chicken farm workers who must grab and toss live chickens into trucks at such a fast pace that they often feel the leg bones crack in their hands — chickens who had lived most of their short lives in an area that afforded each one floor space the size of a sheet of paper and were mercifully on their way to slaughter. And surprisingly to me, it was equally difficult to hear about farmed fish forced to live in spaces so crowded they begin to cannibalize one another, in water so dirty it’s difficult for humans to breathe, before being slaughtered while still conscious and convulsing in pain as they died. If anyone treated my cats this way, I would rip their face off and feed it to them. Of course, not all farms are torturous and not all farm workers are cruel. Those who eat meat can look for the “Certified Humane” label for assurance that the animals were not subjected to some of the worst conditions. And the argument can be made that on some farms, the most humane farms, many animals have lives that are far safer and more comfortable than they would have in the wild. After all, animals often kill each other in ways that are far from humane. And in fact, for a long time, that was my main argument FOR eating meat. Animals kill each other for food. Humans are animals. Therefore, we have the right to kill other animals for food. I argued this point with a friend of mine several months ago, and I felt pretty darned self-righteous about it. Soots and Arya, those two little warm beings lying in the sunny window, don’t go outside. But if they did, they would surely hunt down birds and mice and other small animals and kill them. And not only would they kill them, they’d probably toy with them unmercifully. I’ve seen a cat I loved batting around a little mouse whose hind legs were broken so that all it could do was squeal and suffer. The cat appeared to be fully enjoying itself. What’s more, I feed my cats other animals. Every week we buy ground turkey from the butcher shop for our homemade cat food. We do this knowing that we are trading one life for another. I understand that there is at least one brand of vegetarian cat food, but from my research, I am convinced that cats are obligate carnivores and that they only truly thrive on protein from meat. So I make the choice to sacrifice a turkey’s life for a cat’s life. It’s a conscious, fully-informed decision. Nature isn’t cruel, and neither are the animals in nature that kill and occasionally even torture one another. Cruelty depends on an understanding of cruelty and the ability to choose against it or to choose to ignore it. Unlike my cats, I am not an obligate carnivore. And while I realize there are people whose bodies require animal protein, mine apparently does not. I can thrive easily without meat, double cheeseburger fantasies notwithstanding. So why should I eat it? Why ignore the potential cruelty in eating animals when I can choose not to eat them at all? if an action or policy has a suspected risk of causing harm to the public or to the environment, in the absence of scientific consensus that the action or policy is harmful, the burden of proof that it is not harmful falls on those who advocate taking the action. I now see eating animals in the same way. Do farm animals suffer the way humans do? Do they feel fear the way we would being shipped to the slaughter house? Do they experience pain? Foer suggests that they do, and based on my own personal experiences with animals, I assume that they do too. It sure looks like it to me. Once again, I’m anthropomorphizing. I only have my human experience to draw on. Can I know for sure how animals suffer? No. But can I be sure that “certified humane” animals have not suffered? There are some farming practices that are beyond the purview of certifying organizations. The fate of male chicks from laying hens, for example, that are routinely macerated at birth. Or the fate of animals from humane farms after leaving for the slaughterhouse. Or the simple fact that animals are raised and destroyed before they have completed their lives. How can I take the chance of inflicting suffering on another creature, another sentient being, one that might not be as unlike me as I had thought, when I don’t have to? I, personally, do not need to eat animals. And as a human, I can make the conscious choice not to. So I have made that choice. Or it has been made for me. I guess it really comes down to what my gut tells me. Three years ago, I had a profound, life-altering experience. I saw a photo of a dead albatross chick filled with plastic pieces and read the story about how our everyday plastic use was harming animals in ways I hadn’t imagined. Suddenly, I was changed. From the inside out. For me, the answer is nothing. I just became a dietary vegan this year after watching cowspiracy and BiteSizeVegan videos on YouTube along with lots of praying & thinking about the idea I stopped eating meat, dairy, cheese, egg, & honey. I also don’t use non-vegan heath & beauty products & try to avoid unnecessary leather, wool, silk… by trying to buy these used before looking for them new. Thank you for writing this. I have been a vegan for 2 years and a vegetarian for 4 years and this article clearly explains my reasons for choising this dietary lifestyle. I think that the best option is for us, as humans, to eat invasive species (canada geese, deer, carp) and lower the surplus population instead of supporting the waste of livestock management. I do, however, say this as a vegetarian of over a decade who has gone so long without meat that I wouldn’t eat it even if it were morally appropriate. Thank you for an excellent, well thought out post. I am really happy that it has sparked such a civilized discussion in the comments. Best wishes to you as you continue on this path. Kudos to you! I don’t eat much meat and what I do eat I carefully source. Most is from local farms where I have talked to the farmers. I have given up meat before but with my food allergies have a hard time getting enough protein. Again I eat very little though and only organic, humane (truly!!) meat. I’ve lived on both sides of the meat/vege aisle and think if more arguments for a meat-free diet were written by people who admit to ‘really really loving’ double cheeseburgers, more readers might stop and think about the food they eat (and what it was before it went from pig to “ham”, or cow and “beef”). The adorable kitty pictures and the pug (!) were a nice touch too. That little pug in the photo is Sadie, who belonged to my brother and sadly died from heat exhaustion after getting out of the house in the middle of the Coalinga summer and crawling into a neighbor’s garage for relief. The garage, of course, was even hotter. We all still cry when we think of her. Poor little Sadie. Looking forward to the new blog. I’ve been vegetarian about a year and I’m leaning vegan, but get distressed by all the plastic packaging with “fake” meat products. Not than I’m eating them everyday, but sometimes you need something quick! I eat meat. I eat significantly less meat than I did 3 years ago but I am not likely to give it up. I have also changed to ethically raised meat whose price pretty much limits me to about 1 (sometimes 2) lbs a week. Perhaps something about me is deficient in that it doesn’t particularly bother me that I can eat chicken but I don’t want to eat my cat. Thank you. From the bottom of my heart, thank you for writing such a well-organized, cogent, thoughtful, dramatic, convincing, true story. Bravo Beth! I’ve been a Lacto-Vegetarian for over 15 yrs. I do it for the animals and the planet. PS> And thanks for promoting the book ”Eating Animals” by Jonathan Safran Foer EVERYONE should read it! The difference between cats, dogs, and cows? Diet and potential parasites and diseases for one. Cats and dogs are carnivores, cows are herbivores. Many cultures have domesticated and eaten herbivores. Herbivores can fill a real niche in agriculture if used carefully and consciously. Modern ag does neither. I haven’t eaten any animals but a very occasional bit of fish for over 30 years, still I think animals can have a place in our lives. As long as we do it right and in moderation. Years, ago, I read John Robbins’ Diet for a New America, and almost overnight adopted my mother’s lifelong lacto-ovo vegetarianism (she remained a veggie because she just didn’t like meat). I went a step further and adopted the practice for ethical (an ethic of care) reasons (which was my grandfather’s premise in raising his 8 children this way). I backslid over the years…but am now coming around to it again, and toying with veganism (this time, as much for environmental reasons as ethical ones). Your argument is excellent, beautifully constructed and powerful. Congrats on taking this step! I’ve been vegetarian for 4 years. 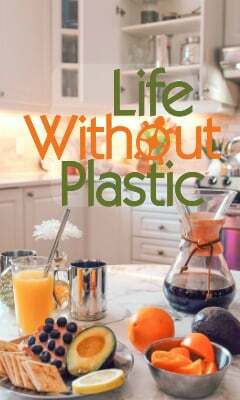 I’ll be interested to read about how/whether your food choices as a vegetarian are affected by living plastic-free. I enjoy the occasional tofurky breakfast sausage or gardein fake chicken breast, both of which come wrapped in plastic. Certainly, there are lots of recipes for fake meats that you can make using bulk items. Hi Kaylen. I expect that nothing is going to change on the plastic front. See, I already don’t really buy meat to have at home. So I don’t think anything is really going to change in the way I cook meals. I’ll still avoid all processed foods that come in plastic. I’ll buy bulk tofu, beans, lentils, etc. I’ll make my own veggie burgers. But these were things I was doing already. I really only ate meat in restaurants or during group lunch days at work. Great post, Beth. Congratulations on your decision and on the many lives you will save, maybe even your own. While some farming situations are certainly better than other, to me, “humane slaughter” is an oxymoron. Would I be okay with a quick, painless death to suit someone else’s taste preferences? Heck no. I want to live out my natural life, and allowing others to do the same seems the least I can do. Laura, eating carrots is definitely murder. We should all learn to live on air. 2) Not allowed to go outside and kill wild animals. Thanks for your response. I was afraid I had sounded harsh when in reality I am so impressed. The consignment store is a great idea. I hate plastic clothing and the lightly used goods would bet a good alternative. Maddie, I actually hadn’t thought as far as leather, but my first reaction would be to look for used leather if necessary. I have a few really nice consignment stores near me that sell shoes in almost brand new condition. What a waste. I’d rather get use out of the leather already in the world than to a) buy new leather or b) resort to plastic. No way!